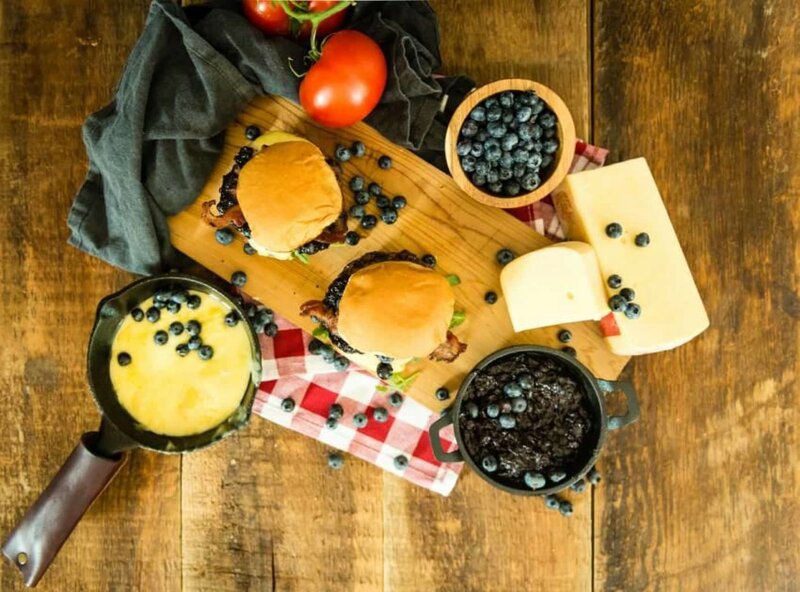 Smoked blueberry compote, smoked grass-fed burgers, thick cut bacon and fresh Raclette cheese on top. 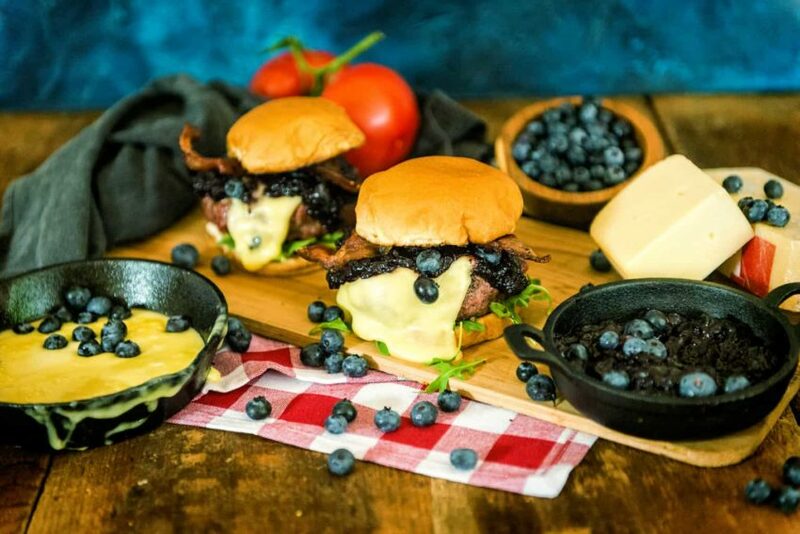 This Smoked Blueberry Raclette Burger is the one burger you have to try! This post was sponsored by Emmi USA however, the thoughts and opinions expressed within this post are my own. But for reals, cheese, ammi right? There is something about the short burst of the blueberry season that inspires so much more than pie for this girl carnivore. Sure, I am not above a sweet treat but there is something about the abundance of summer fruits that makes me want to infuse them with my go-to meaty meals. (And let’s be honest, we all know the fruit season inspires my creative cocktail side too). Lucky for me the fine people at Emmi USA sparked some creativity. Emmi wanted me to sample their raclette cheese, which was super exciting because last Christmas Eve, I enjoyed my first full-on raclette dinner with friends, melting traditional raclette cheese and searing meats on a small tabletop griddle designed for the delicious cheese together in a festive evening. The process takes time, as each little tray only makes a small serving, but is designed to be eaten slowly over time in shared company. It’s just fun. Now, I had a few blocks of cheese all to myself and a hankering to infuse some smoke and sweet and show how this import from Switzerland isn’t just for the holidays. Raclette is a semi-hard cow’s milk cheese perfect for melting. It’s has a mild nutty flavor, and most importantly, it’s fun to play with. See, raclette is made for melting. Specifically to heat, and scrape the melty goodness off, heat and repeat, making it the perfect burger topping cheese for parties when you want to show off your skills to your friends. Without skimping on flavor. Cheese in hand, I wanted to pair this and highlight it in my normal smoke inspired fashion with some other high-class flavors in a napkin needed sandwich. So, I smoked some blueberries. And by smoked, I mean, I made a compote of rum, cayenne, fresh blueberries and caramelized shallots. Yeah, you’re gunna wanna taste test that. I crisped up some thick cut bacon too. Then I put it all together over a big beefy burger. The fun all came together when I scraped the raclette on top and put a healthy portion of the smoked blueberry compote over it all. Burgers never had it so good. 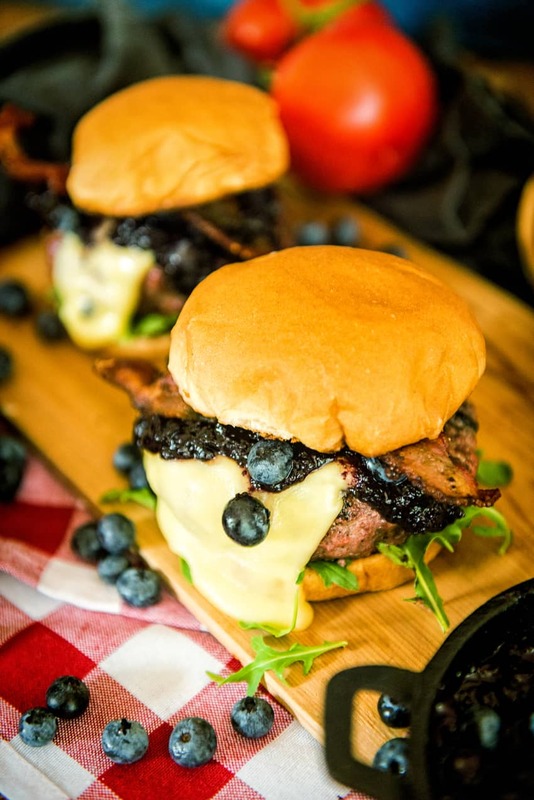 Smoked blueberry compote, smoked grass-fed burgers, thick cut bacon and fresh Raclette cheese on top. Make the Smoked Blueberry Compote. Set your pellet smoker up with hickory chips and set the temp to 425-500. In a small oven-safe pot, melt the butter over the hot end of the grill. Add the shallot and saute 7 to 10 minutes until brown. Stir in the coconut rum and cayenne and scrape up any browned bits on the bottom of the pan. If using, add the brown sugar now and stir to dissolve. Add the blueberries toss to coat. Allow the blueberries to simmer down for 20 to 30 minutes, stirring occasionally. Mash with a potato masher or fork, leaving large chunks halfway through cooking. The compote will thicken as it cooks. If it becomes too thick, add a teaspoon of water at a time to thin out. Remove from heat and allow to cool before storing in an airtight container for up to 5 days. When ready to make the burgers, re-heat the compote for assembly. Fry the bacon in a heavy pan until crispy. Drain onto a paper towel lined plate. For the burgers. Combine the beef in a bowl with the Worcestershire sauce, salt, and pepper. Form into large quarter pound patties with dimples in the center. Smoke until cooked to 160F, flipping once during cook time. Remove from heat and allow to rest. Meanwhile, place the raclette in a small cast iron or oven safe skillet. Place on the smoker and allow the cheese to soften. 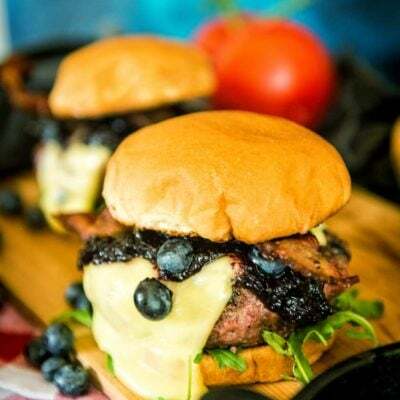 It becomes beautifully scrapeable as it is ready to serve for the burgers, so do this step as the burgers are resting and you are ready to serve to make the most of presentation. Assemble the burgers by toasting the buns. Add a smear of mayo to the bottom bun and top with fresh leafy greens. Add the smoked beef patty on top and then when ready to serve, scrape the freshly melted raclette over each burger. Top with a spoonful of the blueberry compote and the remaining bun half.